Who were Syed Rizwan Farook and Tashfeen Malik? Was Farook a good ole ‘Murrican boy from the Midwest? Was Malik a devout Muslim from Pakistan? Were they radicalized? If so, how? Were they terrorists? If so, why? There are more unanswered questions. Did the two ever meet? If not, how did Malik get a K-1 Fiancé(e) Visa which requires a face to face meet up? Were they married in Saudi Arabia? If so, how did Malik get classed as a fiancée? Were they ever in Saudi Arabia at the same time? Did Malik submit a Saudi police report, since she had lived there for at least 6 months over the age of 16, another K-1 visa requirement. I am an immigration attorney and I find the entire matter incomprehensible. No one seems to know much about anything. News reports from the mainstream media change frequently. The Farook family seems to have an outspoken attorney whom some media outlets castigate as a “truther” (without defining what that means) and as a “massacre denier”. The latter charge seems to rise out of his supposedly questioning the opaque backgrounds and surprising similarities in the inexplicable, increasingly frequent mass shootings occurring during the Obama Administration. One of the attorneys, David Steven Chesley, said at a press conference: “When an incident happens like this, when a Christian goes to shoot up a Planned Parenthood, or an extreme Catholic goes and bombs an abortion clinic, all the headlines don’t say ‘extremist radical Christian’ ‘Christian catholic’ … just like right now every headline is saying ‘Muslim’ and attaching Muslim to it.” This outraged Rep. Diane Black (R-Tenn.), who asserted: “The statements made at this press conference were preposterous and offensive.” Continuing, she said: “…the truth is that radical, violent Islam remains the single greatest threat to the American way of life.” She seems to have forgotten about the effects on the United States about America’s Forever War against Arabs and Muslims. CIA and FBI investigations can take years to conclude. They frequently engender lawsuits compelling them to do their jobs. I myself have handled cases wherein the clients had perfectly clean backgrounds yet could not get their paperwork through the system because of the security services. In one instance, the client had lived half her life in the U.S. and had worked for a high-security company. In another, the client, married to an American citizen in the United States, faced years of delays in getting permanent residence and citizenship. The problem? He had gotten a $40 ticket for being in a federal park after closing hours. And he had a Qur’an in his car. Another client had spent hours in FBI interrogations and endured great delays in becoming a citizen because he had once let a friend sleep on his couch. The Secret Service had previously arrested the friend for taking pictures while Muslim in Lafayette Square, across from the White House. Is there a pattern and practice to this? On December 24, 2015, the Washington Post ran a story headlined “British Muslim family bared from airline flight to U.S.” Minutes before the group’s departure for a trip to Disneyland (and after passing through a security checkpoint), U.S. Homeland Security Department officials canceled the UK citizens’ visa waivers. The Customs and Border Protection agents at the airport did not give a reason for their actions, other than to say “orders from Washington”. The $13,000 ticket costs are non-refundable. What the newspaper did not say was that the American Civil Liberties Union of Southern California had previously published a 5 megabyte pamphlet titled Muslims Need Not Apply. It discussed official U.S. government policy of delaying or denying immigration benefits to Muslims. 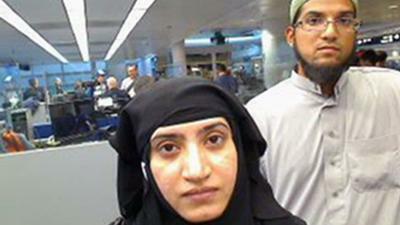 That said, how did Tashfeen Malik, an admitted Muslim, sail through the K visa and permanent residence processes? There seem to be several possibilities: 1. She had help (like the Nigerian underwear bomber). 2. The CIA and FBI and Department of State (which issued the visa) are more incompetent than anyone believes possible. 3. She (and her husband) were not radicals. 4. She (and her husband) were patsies. There seems to be little concrete evidence linking the couple to fanaticism. Farook had a short beard but it was not the full facial covering of extremely religious types. He dressed in Western clothing and not the Pakistani long shirt and trousers (salwar khamis). Malik wore a hijab, but then many Muslim women do. The media place great emphasis on Malik’s Facebook posts about swearing allegiance to ISIL—but then, I know two women with Facebook pages they never created but which somehow appeared on the Internet. They have absolutely no idea how that happened. The whole affair is beginning to resemble the case of Aafia Siddiqui, the Pakistani neuroscientist and alleged Al-Qaeda gun moll with 3 children under the age of 5. After leaving the U.S. after FBI harassment, she disappeared off the streets of Karachi in 2003. At the time, the FBI derided her in almost daily TV reports, completely ignoring the mysterious items her then-husband purchased on the Internet. Then, a family member contacted me for assistance in helping find Aafia. Originally attempting to cooperate with the FBI and the vast alphabet soup of American agencies, the client quickly learned that efforts to help the United States locate Aafia and her three very young children were not welcome. Instead, clumsy, obnoxious, arrogant policemen appeared at her place of work and her dwelling places, at all hours of the day and night, ostensibly seeking information on the whereabouts of Aafia (but not her children). An Assistant U.S. Attorney Jason Weinstein, seized the client’s hospital pager and my emails. Government agents relentlessly interrogated her aged and unwell mother after an 18-hour flight from Pakistan to New York and then shockingly harassed her, her daughter, her son-in-law, and their children in Ellicott City, Md.. Pounding on the apartment door, the FBI, with the full knowledge of the U.S. Attorney’s Office for Maryland, acted as if the family, represented by legal counsel, were dangerous criminals instead of people who might be willing to help locate Aafia. Her brother, in Texas, home of terrorist-fighting family man George Bush got similar treatment. I hear more and I see more comments about the dangers of Islam, usually linked to Arabs and the Middle East. Newspaper articles, particularly in the Washington Post, recounting these dangers invariably cite biased, Israeli-controlled sources, such as WINEP (Washington Institute for Near East Policy) and the SITE Intelligence Group. Television news, which too many Americans rely on, invariably gives an extremely biased presentation of Arabs and Muslims. President Obama and his government seem to be talking out of both sides of their mouths in discussing such actions as the San Bernardino shootings. They deplore the violence but emphasize the “Muslim terrorist” side to them, always bringing in federal anti-terrorism “task forces”. The Obama administration also seems to manage linking them to the availability of firearms, generally ignoring applicable laws violated. Just after the San Bernardino affair, and most likely tied to it, Virginia’s Democratic Attorney General Mark R. Herring abrogated concealed carry-firearms reciprocity with 25 States, claiming it was too dangerous to let licensed citizens of those States travel with their weapons in the Commonwealth. On December 2, 2015, the 21st Century Wire noted that there were three masked assailants and asked, if so, how Farook and Malik could be visually identified. The Wire added that the later shootout was perfectly positioned for a news helicopter to transmit video showing the police blazing away with their latest military-style police gear. However, this did not happen. No images were available, except afterwards, not even photos of police moving the bodies of the alleged assailants from their vehicle, the Wire said. There was also no closed-circuit TV footage of the shooters as they entered the parking lot and then moved into the Center, the site asserted. That’s a lot of people and hardware, even if, as the Wire said, there were two other shooter drills in the area, one on South Waterman Avenue, and one two days before at Victor Valley College Library. The 21st Century Wire further noted that ATF and FBI agents began armed door to door searches of all houses in the vicinity of the SUV shooting scene. (No mention was made of whether warrants were used in those actions.) One TV anchor, the Wire added, claimed that “San Bernadino is now under Martial Law”. Further, the Wire asserted, many news outlets, including “the Israeli-run site Vocativ”, claimed that the San Bernadino event was an “ISIS attack on American soil”. As Rappoport asks, what are the odds of this happening so frequently? COMMENT: There are far too many loose ends and unanswered questions. Many people allege that “crisis actors” (people who pretend to be shooters or victims) take part in events like San Bernadino. They overlook the idea that it would take an army of these (with attendant leaks and bragging) to cover just one of these happenings. It’s far more likely to have a handful of individuals inserted as real police or military to control and direct one of these shooting events. Ideal candidates for such would be personnel from the many intelligence services. Other possibilities, as the 21st Century Wire suggests, would be to use mass shootings by “crazed Muslims” to whip up popular support for Barack Obama’s sending more soldiers, sailors, and Marines into the Middle East. This would end the ISIL “threat” once and for all. There would be the added political advantage of the alleged “indecisive” Obama acting “presidential” and more warlike. It’s past time for all of us to ask the mainstream media some hard questions about why they don’t report what is really happening. And to give us some real, fact-based analysis of current events.